Passengers is a book I received during its original publishing launch for review. For whatever reason I just never quite was in the mood to pick it up to read despite the interesting premise. Fast forward two years and a TBR that is judging me endlessly for not reading and so here we are. Unfortunately while the premise to Passenger is stellar it's execution left little to be desired. One of my biggest issues with Passenger is the pacing. This book is slow. Not a slow burn mind you, just slow. You have a fantastic time travel plot and then kill it by describing every single insignificant detail about the characters personality, the music they listen to, the clothing they wear and on and on. I love world building but not when it kills the story from moving forward. Case in point. You have the London Blitz shown in one of the scenes and instead of giving a very fast paced action scene with the characters in danger you have them sitting underground listening to a violinist play to keep people calm. It could have been a moving moment after describing the devastation left in the bombings wake but instead I was left just bored by it all. Another issue I had with the story is the forced relationship between Etta and Nicholas. I get they are both on the journey together and roughly (Nicholas is considerably "older") the same age but they have zero chemistry together and the whole thing feels forced. I've said it time and time again and I'll say it until I'm blue in the face but not all relationships in YA novels (or any really) need to be romantic. Platonic love and friendship are just as worthy. Of course I don't even really consider Etta and Nicholas friends because like I mentioned before they have no chemistry. Colleagues would be the closest I'd call them and that feels generous to me. Lastly, I really did not like Etta. She was a very bland protagonist who lived inside her own head way too much. We did see a few moments of the person I'm assuming she will become (feisty, strong willed) but waiting for that moment too happen and hoping she'd crawl out of her head left me wanting to throttle the character more often than not. Now one thing I did enjoy about the story were the moments of actual time travel. Alexandra Bracken could have easily just dumped her modern thinking characters into whatever society they travel to but she took care to make sure they didn't stick out too much providing them with a bit of insight before the actual travel happened. Most books focus on time travel as an after thought and while this story at times did feel that way (hello first half of the book) once Etta and Nicholas actually started moving around and going to explore worlds (I say worlds but really I mean points in time) it was enjoyable (minus the Blitz cause she could of done way more with that). Overall, Passengers provided me with a relatively decent story and kept me curious enough to continue reading until books end. I'd recommend picking this one up only if you're A. An Alexandra Bracken Fan. B. You don't mind a story with a very slow build up and also one filled with sometimes boring introspective conversations. 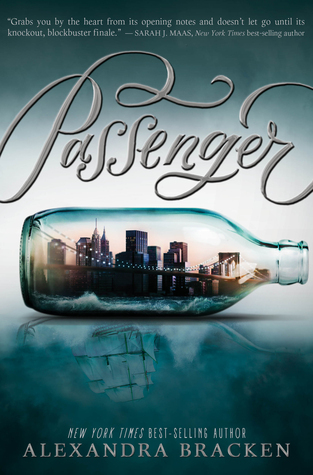 With that being said, I'll be rating Passenger (Passenger #1) by Alexandra Bracken ★★★. *Copy reviewed received from publisher during original launch promotions. All opinions are my own and I was not compensated in an which for providing them.